I am in the middle of needing to do quite a bit of secret sewing, which is really hard for me! I love getting to share my progress and what I am learning with you on my blog, and I worry that it is is not authentic to do a bunch of secret sewing with only “Ta-da!” kind of posts. Thankfully, projects create scraps. And while I feel like I have a lot of different irons in the fire, it’s never hard to say no to a new project… especially once that uses up delicious scraps, right? That’s right, I have already cut into the Anna Maria Horner True Colors fat quarter bundle and charcoal Essex linen that I shared on Sunday. Not just cut into it, but I have scraps and have made this 22.25-inch wide by 26.25-inch tall mini quilt top! The colors really do just seem to glow in person. I also spent some time this past weekend doing some sample sewing for a new pattern that I am VERY excited about. The test block went together pretty well, so now I need to buckle down and sit at the computer to finish out the details so I can order fabric to do a full quilt test. Even though all the sewing I’m sharing today used up fabric from my (admittedly small) scrap bin, the scrap bin lid will not close and is literally overflowing, so I see another project coming up where I sort through the bin and see what wants to be made to help lower the volume back down to a more reasonable level. I have also been scratching another crafting itch. Last Friday night I hosted a craft night at my house, and for those who attended and were interested, I had some embroidery floss on hand and taught how to make the knotted friendship bracelets I pumped out by the dozens as a teenager. I gifted two bracelets and then started working on a set to stay at home. My husband picked out a lovely ombre fade from yellow/brown through green (inspired by nature / turtles). And I couldn’t wait to start on a rainbow color order version for myself. 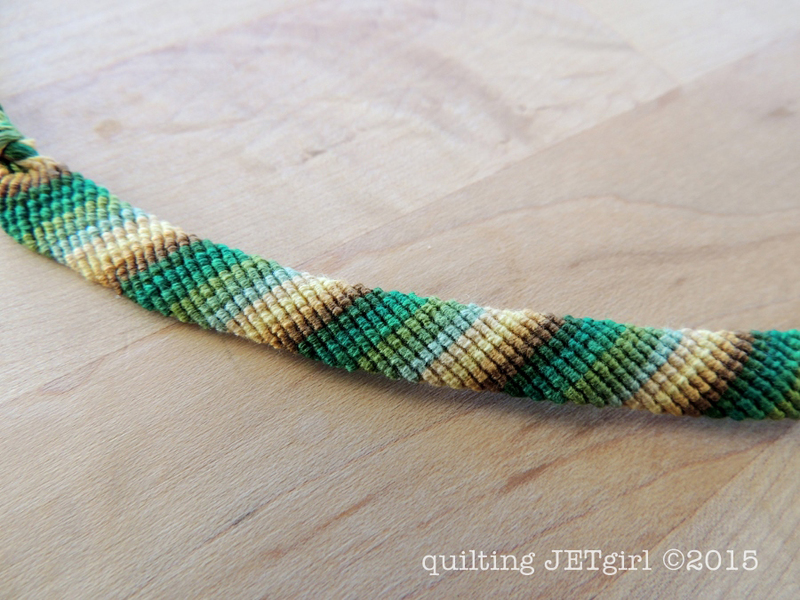 It took 1,440 knots to make the bracelet for my husband. 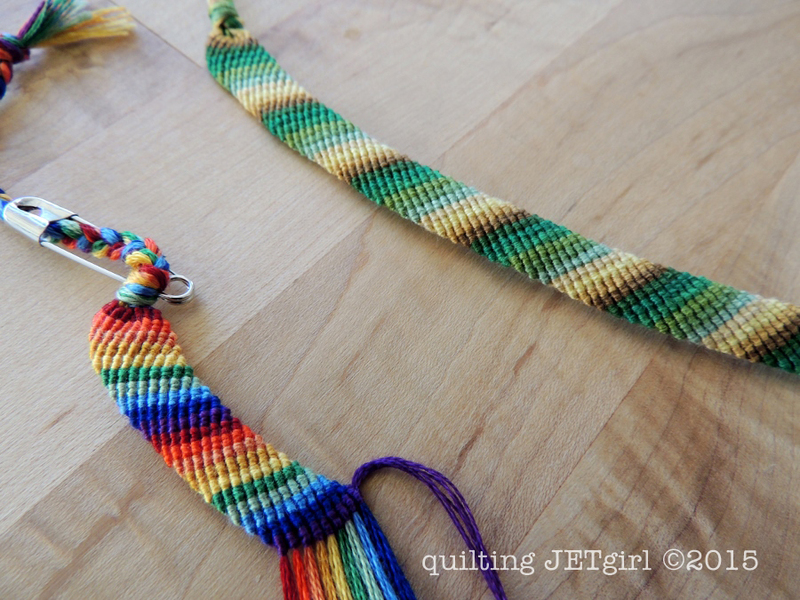 I have some pretty impressive blisters on the side of my index fingers, so I think I’ll have to rest for a bit before I can get back to finish up the bracelet for myself. So I keep telling myself it is OK to write less on my blog and focus on the other goals that I have and deadlines I need to meet… which makes me think it is time to put some thought into my goals for 2016, so stay tuned for a 2016 goal link up party with opportunities to win some fantastic gifts to get you motivated and excited for the new year! 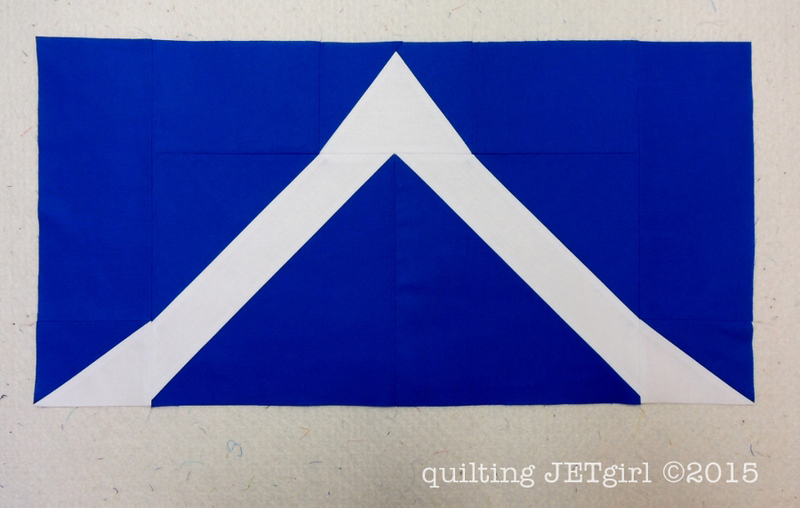 Historically, I am not a very goal driven person…quilting seems to have brought a bit of goal tending to the mix, a good thing! 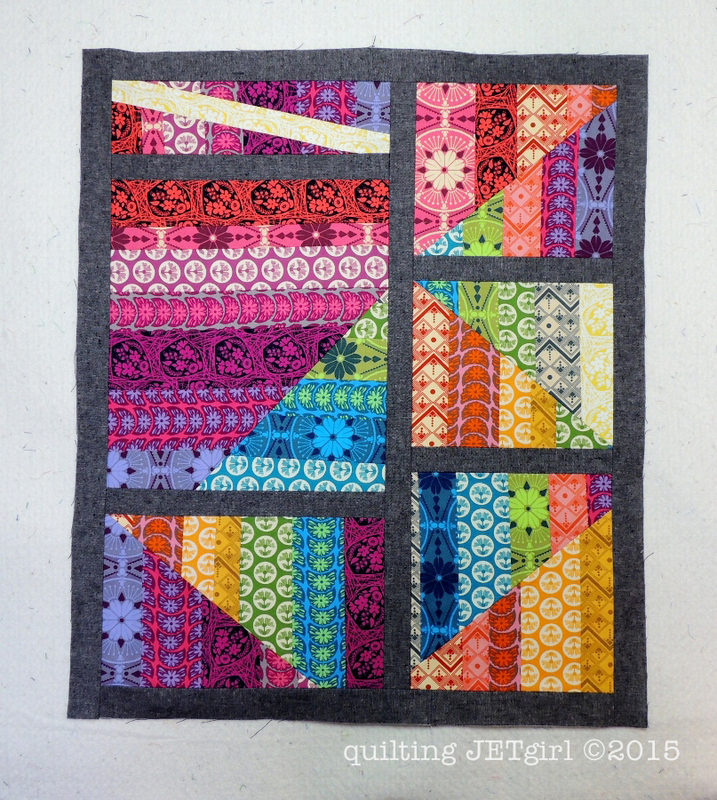 I will definitely be looking forward to the linky, as I have already put many quilty goals together for 2016! You have taken me back…way back…with the friendship bracelets! They really are gorgeous. Your AMH quilt is a bright and cheery delight! Awww, the colors! Sometimes ‘Ta Da’ have to happen. I think we all understand therre are some projects that can’t be shown. But it’t fun for me to see them when they can be! I understand the conflict of secret sewing. I also understand not sharing process shots. I have been without a good camera until recently, and it was hard sharing the cruddy pictures I take with my ipod. Now that I’ve got a good camera, and I’ve got more time to sew I hope to share more of my work, not just the ta-da moments! Ah… secret sewing… a sometimes entirely necessary part of being a blogging quilter. I don’t know how you accomplish so much Yvonne. 🙂 Love the look of the AMH scrappy, especially set against the dark Essex linen! And Yay for a new pattern! You say your scrap bin is small, but I find that hard to believe. 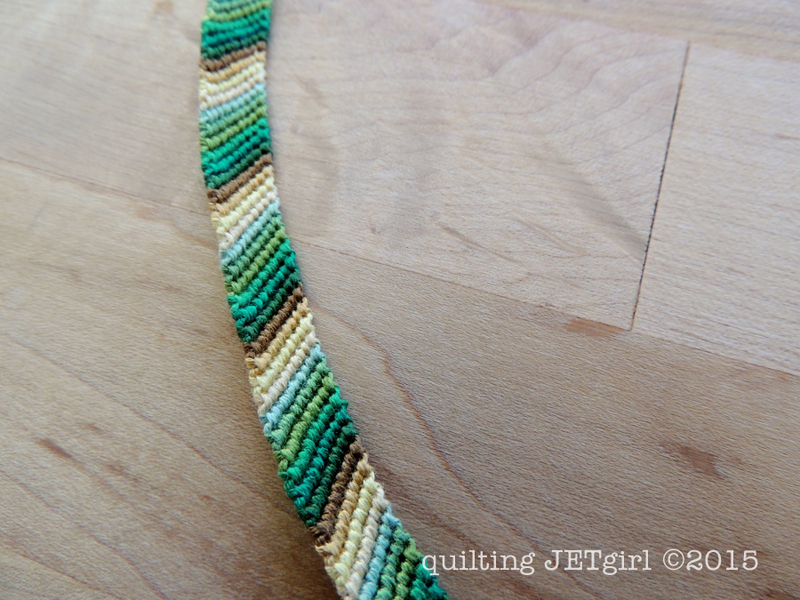 You make so many projects…how do you not have scraps. LOL Great job on the friendship bracelets. Give those fingers a rest. I love making those. My nieces put a huge dent in my floss stash in the 1990’s and my boys finished off all the pretty colors in the 2000’s. I decided to do some stitching a couple years ago and opened up my box to the most depressing colors imaginable. I did some happy shopping and now I am set for my grand-niece and nephew, who are quickly approaching the friendship bracelet age. When they visit they go straight to the crayon and marker stash now. Yvonne, The projects that you are creating with the scraps mentioned and pictured are beautiful fabrics! I can see why it was so easy to begin making scrap blocks with them. I truly enjoy creating all sorts of projects with scraps. Will continue to check my daily email and see what you are creating! I have discovered so many new craft opportunities this year on Pinterest, it truly amazes me! This Christmas I have decided to bite the bullet and give several of these methods a try. Although your braided bracelet is not one of the ones I chose; it is one that I want to try at a later time, only I would like to learn how to add beads also. I think the colors that both of you chose for your bracelets are beautiful combinations! How fun that you had a group over and taught others. It is always more fun with others! Thank you for sharing and have a wonderful creative day! I’ve already started a list of resolutions for 2016! So count me in for the linky party. Those bracelets are so pretty! I used to make simpler ones as a kid, it was a great car activity, or tv watching activity. I still have a lot of the leftover embroidery floss even. Love what you did with all those AMH scraps! I’ve had a couple magazine projects that I’ve worked on, and found it so hard to work so intensely on a project, and then have to wait for months before I could share it… so I know your dilemma! I think that Ta-da blogs are hard for me to read, and I much prefer seeing the WIP process. You can never go wrong with AMH scraps! Wow, those friendship bracelets are giving me serious flashbacks!.. you’re not the only one who pumped these out! I’m looking forward to seeing your secret sewing; the scraps you’ve produced are so bright and happy. These prints are a bit outside your norm which has me excited to see what you’re working on! 🙂 The friendship bracelets look like a lot of fun…I hope you can finish yours soon. Wow they all look great. You seem to be having fun. I too am super busy so I just posted the same post I did Monday. Maybe I’ll be able to share what I’ve been working on today, tomorrow! We used to make those bracelets too in school and I think I had 5 on the one had at some stage! They are great fun and I look forward to your secret sewing when its ready to be shared! I love your statistics. That is a ton of knots! I need to do a scrap box dive and identify what could be made from mine too. I don’t want it growing beyond what the box will contain. I deliberately only do ‘ta-da’ posts – finished projects with an explanation of how they came about. I figure no one has time to read all my rambling WIP updates, and I certainly do not have time to write them. Do whatever works for YOU. Your blog = your rules. The AMH scraps look so gorgeous in your mini quilt, and lovely bracelets too, that’s a lot of knots!